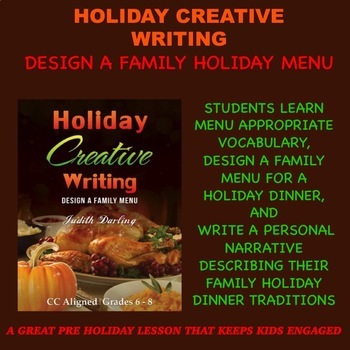 In this fun holiday writing lesson, 6 - 8-grade students will design a family menu after learning menu appropriate vocabulary. Then they will write a personal narrative describing their own family traditions, or a particular story that happened at one their family holiday gathering. It can be centered around any holiday or family gathering such as New Years, Christmas, Thanksgiving, 4th of July, Halloween, birthdays, anniversaries, and even a wedding celebration. This lesson is CC aligned for those teachers that need an alignment. If you don't, then please disregard the alignment and have fun teaching writing. This is an excellent lesson to keep students engaged because it is student directed and includes a creative art project along with an interesting writing assignment. Students edit and grade their own paper before turning them into the teacher for a final grade. This significantly reduces the teachers grading paperwork load, making for a much nicer holiday for teachers too. 1. Students that don't celebrate certain holidays can make a menu for a favorite family meal. 2. This assignment can be completed in one week, but two weeks will produce a much nicer finished product. A Thanksgiving Narrative Writing Lesson that is CC Aligned by Judith Darling is licensed under a Creative Commons Attribution-NoDerivs 3.0 Unported License.